Does Anti Seize cause Corrosion? 1. Does Anti Seize cause Corrosion? 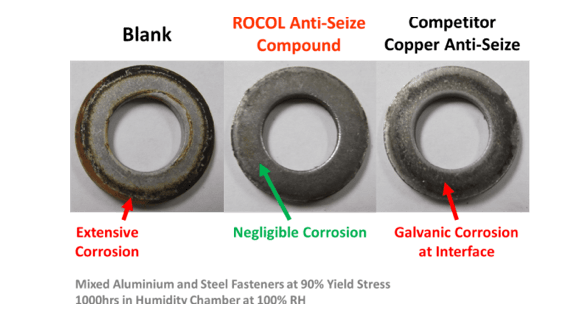 It is often said in industry that copper-based anti-seize compounds can cause galvanic (bimetallic) corrosion in some systems, particularly involving stainless steel or galvanised fasteners. In the overwhelming majority of stainless steel or galvanised systems, this does not occur. In the few systems where this does occur, it is often caused by a low-quality anti seize compound that dries out, evaporates or washes out – This can leave bare copper and bare steel/zinc in the presence of water. If bimetallic corrosion is a risk or likely to occur in a particular system, ROCOL suggest the use of Anti Seize Stainless, which is free from metal powders, or Anti-Seize 797 (Nuclear Grade) which is a nickel-containing alternative to copper.